ACC Fan Blog - ACC News and Opinions: Innocent!!! In all of the stories I'm reading, words like acquitted and charges dropped lead the stories. After all this time, I don't understand why people are afraid to tell the truth, these kids are "innocent". There is absolutely no evidence that they did anything other than attend a party where there were poorly chosen strippers. On the other hand, there is evidence that Crystal Mangum, shown below(WRAL Photo), perpetrated a hoax. Of course, legally holding her responsible for that is hard to do despite testimony from her co-worker for that night. 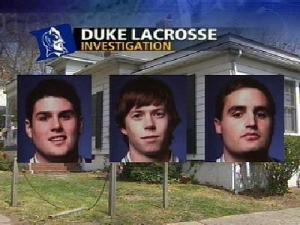 But at this point I think it is safe to say these guys were the victims and a whole lot of people owe them apologies. Nifong needs to be very worried right now. At best, he will be repremanded by the NC Bar. At worst, he is looking at losing his law license, fighting law suits and possible jail time. One can only hope that he will do Durham County a favor and resign from his post. Remember this is a man who promised the Governor that if appointed to fill the vacant DA position in Durham County, he would not run for election. Does anyone remember what his first action was? He forced Assistant DA Freda Black to resign. Black had been one of the prosecutors in the Michael Peterson trial and had been considered by many one of the front-runners to be elected DA.